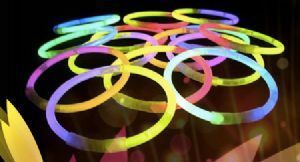 These 8’ mixed colour or bi-colour glow sticks are just 5mm thick and are the generic ‘clubbing’ glow stick. They come in tubes of 100 alongside of 100 connecters per tube to turn them into bracelets (or anklets/belts/fashion accessory…the list goes on!) They glow for up to 24 hours, too! For mixed colours, the products come in an equal measure of Orange, Pink, Blue, Green and Yellow per tube of 100.